Application Deadline: May 10, 2019 4:00 p.m.
Read the guidelines and click here to apply. The Office of Arts, Culture and the Creative Economy (OACCE) is seeking proposals from Philadelphia area artists and arts organizations to provide activities during “Make Art Philly” , a free summer art-making event at the City Hall Courtyard geared towards children 5-12 years of age. We are seeking multiple artist/arts organizations to provide art-making activities of various types such as print-making, clay building, painting, etc. and one artist/arts organization to provide two 30-minute sets of an interactive performance during the event. Make Art Philly is an outdoor event scheduled for Wednesday, July 17, 2019 from 11 a.m. – 2 p.m. (rain date Wednesday July 24) in City Hall’s courtyard. OACCE will select 10-12 artists/arts organizations to provide an art activity targeting 400 summer campers and Philadelphia children. 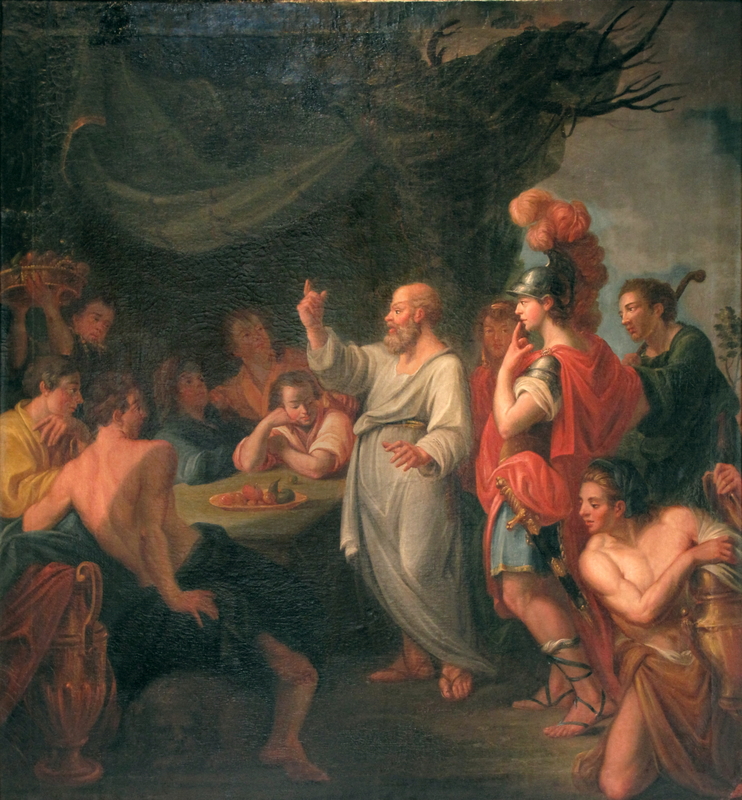 Artists/arts organizations will be selected based on the uniqueness of the project, and satisfaction of the requirements listed in the application. This is also an opportunity to highlight your organization’s arts education programs and opportunities you provide. Attend A Student-Run Handshake Training Session! 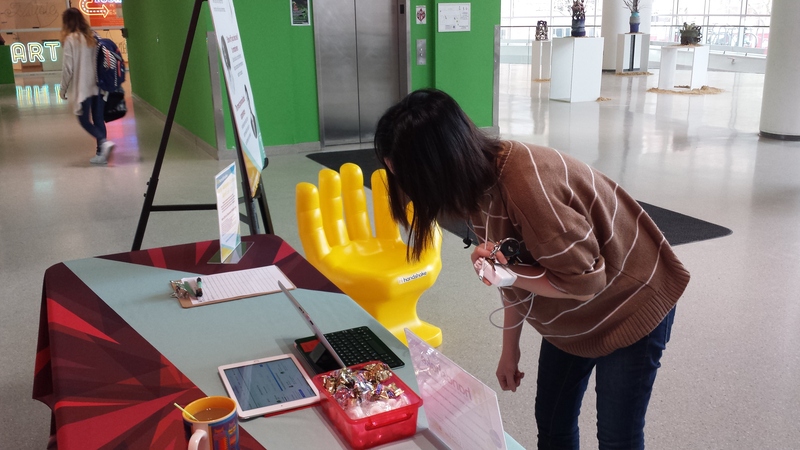 Posted on April 9, 2019 by Kari Scott| Comments Off on Attend A Student-Run Handshake Training Session! Have you heard of Handshake, but are not sure how to use it? Maybe you’ve logged in once or twice but have been overwhelmed by the options? Temple students just like you are offering training sessions to help you figure out how to maximize the system using a few easy steps. View and sign up below for one of four upcoming Handshake training sessions on Monday, April 15 and Thursday, April 18! Temple’s student-run Freely Magazine is hosting a global showcase event on Monday, April 15 from 5-7 pm in the SERC building. Susanna Foo, a Philly-based chef and two-tim winner of the James Beard Award, will demonstrate her cooking and talk about what inspires her unique style of cultural fusion. There will also be an international photo exhibit and performances. Mia Stavarski, a Tyler Art Therapy major, is putting together an event for students here at Temple. 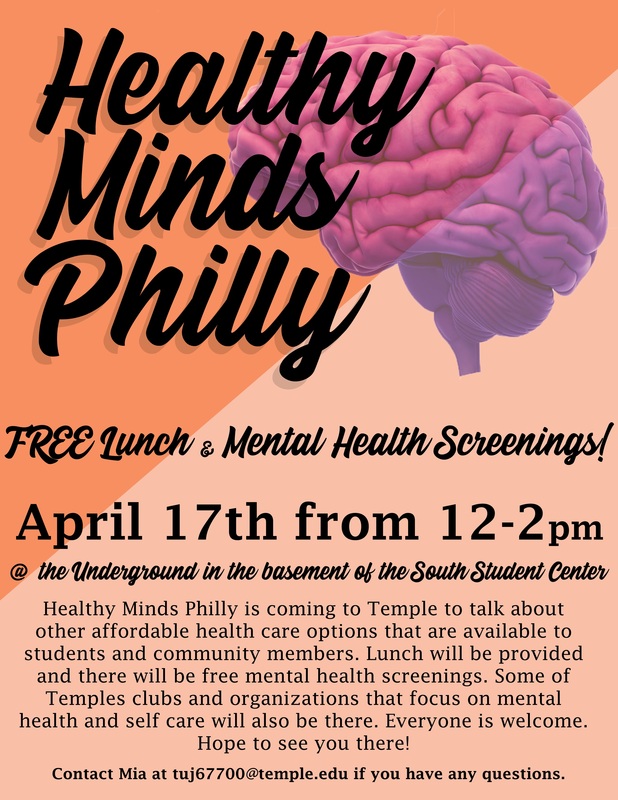 She’s invited a branch of the Philly Department of Behavioral Health called Healthy Minds Philly to come to Temple for a talk. They will be discussing affordable and accessible health care besides Tuttleman counseling based on insurance and distance. There will be free health screenings after the talk as well as lunch. There will also be tables with clubs that promote mental health for others to join. This event takes place on April 17th from 12-2pm and will be held in the Underground, which is the basement of Student Center South. The Binder Project makes its curatorial debut at the Painted Bride Art Center with a collective exhibition of 20 artists from a variety of disciplines. 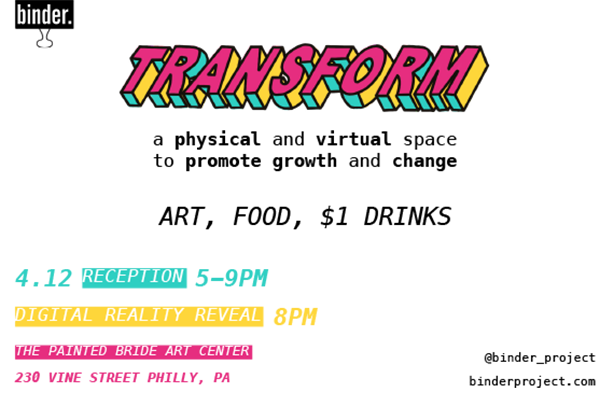 This latest project, Transform, will be on view for one-week beginning with their reception Friday, April 12th, 5-9 pm. Transform features work that explores the effects of growth and change and how everyday experiences, places, beliefs, and stories can be transformative. The Binder Project is in itself a transformative endeavor tackling the discourse of physical vs. virtual exhibition spaces. The team has worked to mirror the concept of the exhibition, enlisting technology that transforms the conventional gallery space into a widely-accessible digital reality. The Binder Project is part of an ongoing experiment in the possibilities of the online curatorial enterprise. Created by Grace Harmer, a senior Art History student at Tyler School of Art, The Binder Project aims to build relationships between underrepresented and emerging artists while generating an accessible digital space for their works to flourish and be seen around the globe. The Binder Project is a unique and suggestive platform run by artists, for artists based out of Philadelphia. As an online platform, it provides a space for creatives to showcase their art widely, Binder gives the opportunity for your work to be seen by all. The goal of this project is to bring together mediums and people from anywhere and everywhere creating relationships between artists facilitating partnerships and promoting collaborations. To learn more about The Binder Project visit binderproject.com or contact Grace Harmer: binderprjt@gmail.com. 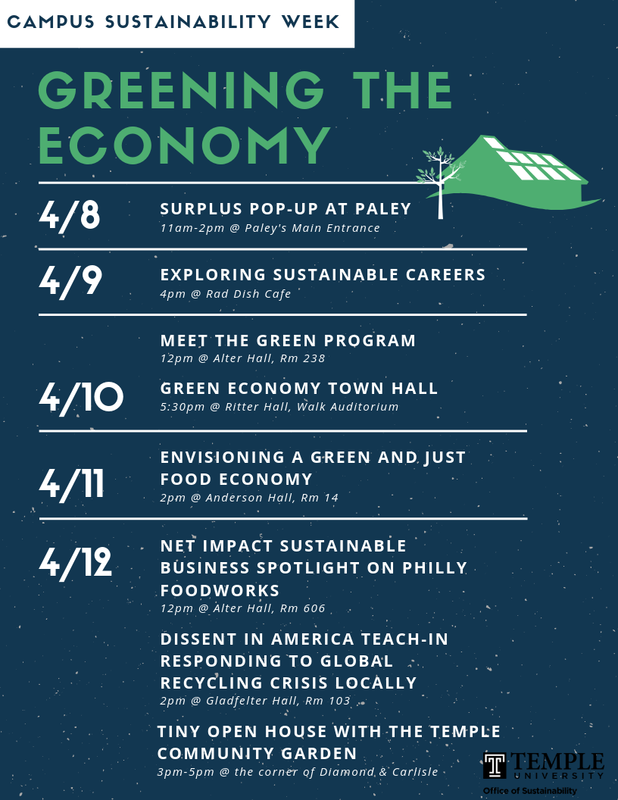 It’s Sustainability Week at Temple! Posted on March 28, 2019 by Kari Scott| Comments Off on It’s Sustainability Week at Temple! Learn more about all these events and more here. 16 fewer households’ energy consumption. Try not to miss the competition too much. We’ll be back next year better than ever, and you can always watch our awesome videos until then. Join us and be a part of this SOS performance piece to spread awareness to help others. This is a great opportunity to make a difference, make new friends, serve a worthy cause, and connect with the community. Food and drinks will be served after the performance. WHAT: A performance piece where people will be standing together spelling out the symbol SOS to support for human rights. WHY: To spread awareness about human rights in issues related to immigration, refugee, women, and LGBTQ rights. WHERE: Tyler School of Art in the courtyard area. (Located on Temple University’s main campus). 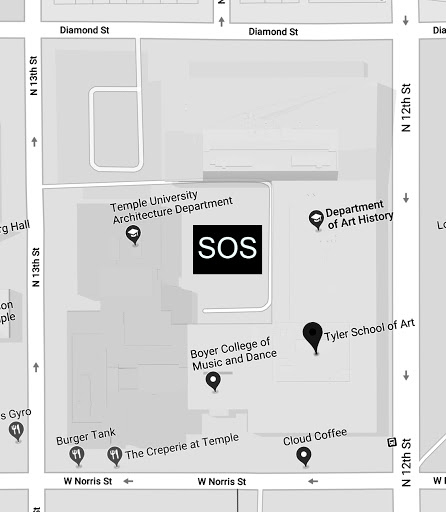 HOW: Once everyone shows up at Tyler School of Art around 6pm, the performance will start from the cafeteria area at 6:30pm where everyone will get into positions and be guided by a few coordinators out in the courtyard. Everyone will stand together for a duration of 15-20 minutes once the SOS symbol is complete. MORE WHY: My senior thesis performance piece is driven by the experience and heritage of Vietnamese refugees and immigrants, this SOS performance piece aims to inspire a mission and vision in building a stronger society based on the principles of justice and equity for all. The performance takes an active approach that aims to support immigrants and refugees and other politically, socially, and economically marginalized communities as they seek to advance the conditions of their lives in America. In 1986, my mother gathered my two older siblings in her arms, and hastily boarded a ship to escape the ravages of the Vietnam War. They were left stranded at sea for weeks, until they were rescued by a Thai freighter. People on board had tried to increase the visibility of the ship by waving flags made from the shirts on their backs, and some had laid down on the floor to spell out SOS with their bodies. This performance is inspired by the events that my parents and others have experienced during their escape from Vietnam. Through their actions, they provided me the opportunity to live the life I am fortunate enough to live today. By sharing the story of the hardship they endured, I see a chance for myself to provide an opportunity to those around me, while simultaneously paying homage to my parents for their sacrifice. The long-term goal of this performance is to strengthen and support the underserved communities of refugees and immigrants from around the world, and unite us all with other socially and economically marginalized communities as we all seek to advance the conditions of our lives. One of the major obstacles in the way of this advance is visibility, so what I envision for this performance is to bring light into the shadows of underrepresented people in the United States. Many people in this country know nothing of the hardships and atrocities experienced by refugees and immigrants on their way to make a better life here. Similarly, many people don’t know anything of what it’s like growing up as a minority, or growing up poor, or LGBTQ, or even growing up being told you’ll never amount to anything. I’m playing the role of the ship that rescued my mother and father and siblings after they cried out for help and visibility. Please contact Anna for any questions by email: trieu27@gmail.com or text: 610-999-0628. Nominate Your Faculty for the Lindback Award! Posted on March 18, 2019 by Kari Scott| Comments Off on Nominate Your Faculty for the Lindback Award! The Lindback award recognizes highly talented and dedicated faculty for outstanding teaching. Consideration is given for mastery of subject matter, innovative teaching methods and materials, effective relationships with students, development of new courses, achievements of students, and continuous efforts to improve teaching. All full-time faculty who have taught at Temple for at least three years are eligible. Undergraduate, graduate, and professional students are invited to nominate an instructor for the Lindback with a letter of nomination that includes specific examples of teaching excellence during any academic year or years. Send nomination letters electronically to strommen@temple.edu by April 10. Contact Prof. Strommen with questions. Thank you. Our VIRTUAL career event, Intern Philly, is kicking off on March 19! Employers from all over the Philadelphia region will post jobs and internships for which they’re currently hiring from March 19-29 on the Campus Philly Launch Site – the best spot for college students like you to find your perfect fit. We’ve rounded up everything you need to know about the Launch site on the Campus Philly blog – check it out + create an account today (it’s easy)! Help Carver High School Fund a New Mural and Horticulture Project! Posted on March 14, 2019 by Kari Scott| Comments Off on Help Carver High School Fund a New Mural and Horticulture Project! 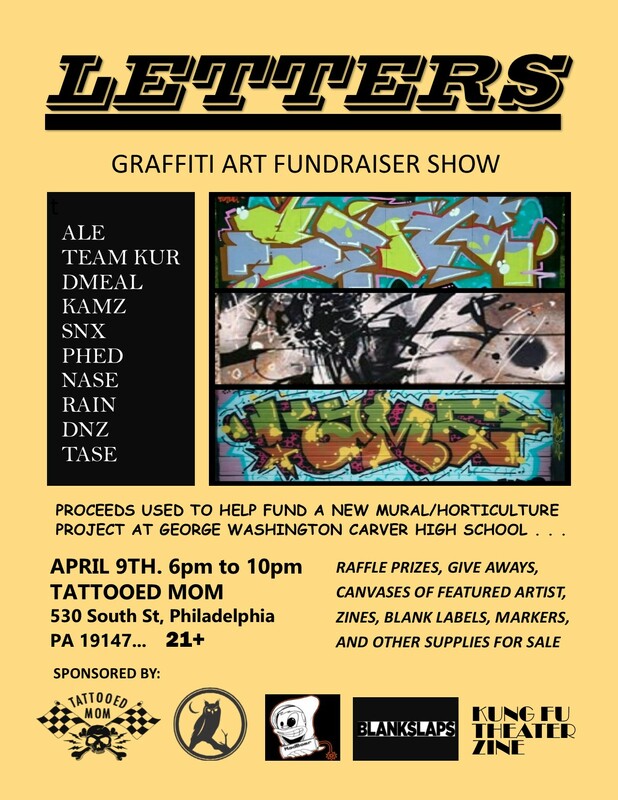 Tyler Community Development Major Jon Fiamoncini is coordinating this fundraiser next month to help our neighbor Carver High School with a new mural. If you’re over 21, go and support this worthy cause!